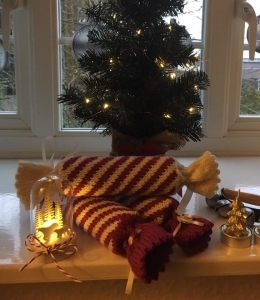 A free pattern for knitted crackers. They are knitted in the round and are moderate. And now, your Christmas pattern. This is a fairly quick to knit pattern for candy-stripe crackers. DK wool in 2 shades, A & B. I can make 3 crackers from 2 x 50g balls of wool. 4mm needles to knit in the round – Magic Loop/2 short circs, or DPNs. Ribbon to tie neck of cracker. Size: Finished cracker: 10 inches (26cms) end to end; Cracker barrel: 5.5 inches (14cms) x 6.25 inches (16cms) circumference. Tension: 22 sts and 30 rows to 10cms in Fairisle pattern on 4mm needles knitted in the round. The ends are a multiple of 2 stitches; the candy stripe is a multiple of 6 + 5 stitches. 2SCs = 2 short circulars. DPNs = double pointed needles. Kf&b = knit into the front and then the back of the next stitch. With A cast on 28 sts. Arrange so you have 14 sts on each of your 2 needles if knitting ML or 2SCs, or evenly on DPNs otherwise. PM. Join to knit in the round. Next Rnd (picot fold-line): *Yf, k2tog, rep from * to end. Next Rnd (dec): *K2, k2tog, rep from *to end (21 sts). Next Rnd (eyelet): *Yf, k2tog, rep from * to last st, K1. Next Rnd (inc): *K3, kf&b, rep from * to end (35 sts). Rnd 1: *With A, K3, with B, k3, rep from * to end. Next Rnd: as last Rnd but slipping M as you pass it. The stripe will jog forward by 1 st each Rnd. Last Rnd forms Candy Stripe patt. Cont in patt until stripe section measures 14 cm. (I did 42 rounds). Break off B. Next Rnd (decrease): Using A *K3, K2tog, rep from * to end (28 sts). Next Rnd (decrease): *K2, K2tog, rep from * to end (21 sts). Next Rnd (inc): *K2, kf&b, rep from *to end (28 sts). Cast off loosely (or using size 4.5mm needle). Turn cracker inside out. Sew in ends. Sew picot edge down at fold. Turn cracker RS out. Thread a length of ribbon into each end at the eyelet points. Insert tube. Fill tube with wrapped sweeties or chocolates. Or jewels. Or rolled bank notes. Tie the ribbons to secure the closures and hang from your tree or place on the festive table. I hope you enjoy these, I enjoyed designing them!